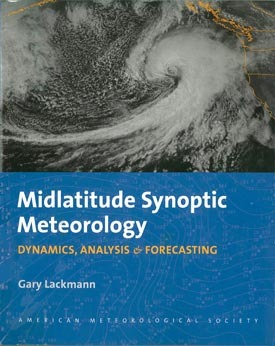 The newest title from AMS Books is now available: Midlatitude Synoptic Meteorology: Dynamics, Analysis & Forecasting, by Gary Lackmann of North Carolina State University, links theoretical concepts to modern technology and facilitates the meaningful application of concepts, theories, and techniques using real data. It is aimed at those planning careers in meteorological research and weather prediction, and it provides a template for the application of modern technology in the classroom. Among the topics it covers in depth are extratropical cyclones and fronts, topographically trapped flows, weather forecasting, and numerical weather prediction. The book is generously illustrated and contains study questions and problems at the end of each chapter. Midlatitude Synoptic Meteorology–as well as other AMS publications and merchandise–can be purchased from the AMS bookstore.